As a counselor, Samantha Ashford (B.A., Sociology, ’13; M.S., Counseling, ’16) has always had a strong desire to give back to the community. “Being a counselor, that’s what you do — help others,” she says. A native of Florida, Ashford is familiar with the devastation caused by hurricanes and the long time it takes to rebuild. So when she found out that the Red Cross was seeking licensed mental health counselors to help in the wake of Hurricane Harvey, she felt fortunate that she had skills that would allow her to contribute to the relief effort. While she was going through the volunteer application process expecting to go to Houston, Hurricane Irma made landfall in Florida. The Red Cross needed to send health workers there immediately. Ashford was asked if she would be able to leave on one or two days’ notice. “I was called on a Friday and asked if I could leave Sunday,” she recalls. On September 17, she began her nine-day volunteer stint. 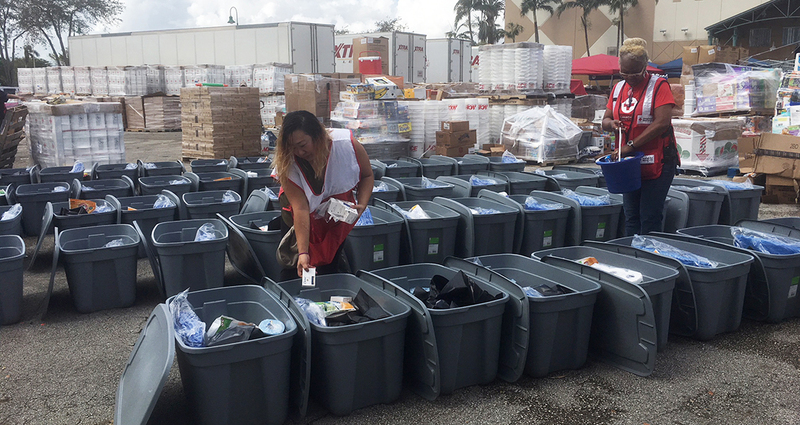 Set up in a large convention center in Miami, the Red Cross shelter where Ashford worked was geared toward people who needed a longer-term place to stay than evacuation centers could provide. It served around 1,000 people, many of them adults, elders and families of low income and/or homeless. They were provided with beds, showers and hot meals. Pets that belonged to people who had been evacuated were sheltered too; the Red Cross provided carriers and pet food. The volunteers were housed in the same convention center, sleeping on the floor, or in cots when they were available. In her master’s program in marriage and family therapy and school counseling, Ashford had learned to build rapport with her clients, advocate for them, and show empathy. As a Red Cross mental health crisis counselor, she called upon this training to help people displaced by the hurricane. Her work involved “listening to their story, understanding their struggles, and validating their feelings of fear, stress, anxiety and grief.” She also spent time advocating for her clients’ needs. And importantly, she helped them identify ways to cope with the crisis. “One lady couldn’t even remember her kids’ names because of the stress level,” Ashford says. Working various long hours, some days from 7 a.m. to midnight, providing mental health crisis counseling, proved to be very intense and challenging work. In fact, prior to counselors’ departures, the Red Cross emailed flyers to their families advising them on how to care for their family members upon their return home, anticipating that the volunteers might suffer vicarious trauma. Ashford says she called her husband the first day saying she wanted to come home, but he helped her focus on the reasons she had wanted to be there. And even though the counselors were all overwhelmed — there were only 10 of them to serve 1,000 clients — they took turns supporting each other. 1. After the shelter reduced in size from people returning to their homes, Samantha Ashford and other Red Cross volunteers created care packages for Red Cross drivers to deliver them in the community. Some items in the care package include toiletry items, tarps, trash bags, rope, flash lights, toilet paper, etc. 2. The Red Cross Shelter at E. Darwin Fuchs Pavillion in Miami-Dade County, served about 1,000 people from Miami, Monroe and Key West who were affected by Hurricane Irma. 3. Even animals need support — one of the many displaced animals at the shelter receives comfort.